This deep structure, made of connective white matter, relays information between the thalamus, which is involved in mood regulation and sensory-motor functions, and the cerebral cortex, where higher-order thinking processes occur. Studies of brain injury and stroke have trained attention on this region’s role in depression, while ablative surgery has shown that severing the connection could treat very severe cases. People with damage to the left side become depressed more frequently than patients with damage to other parts of the brain. The region (the left side in particular) appears hypoactive in brain scans of depressed people. This network, thought to be important in regulating emotion, includes such structures as the hypothalamus (c), amygdala (d) and hippocampus (e). 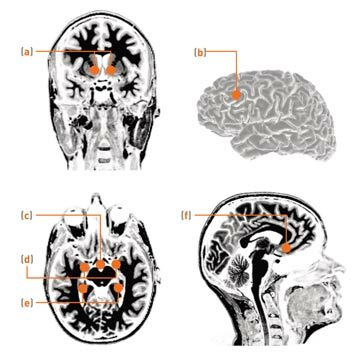 Another key structure, Brodmann area 25 (f), is found in the subgenual cingulate, which in turn lies in the anterior cingulate, where the cortex folds inward toward the brain’s center. Imaging studies have shown that the feeling of deep sadness in depression is linked with abnormal activity in area 25, and that people recovering from depression have subdued activity there, while autopsies have shown structural abnormalities in the same region, with fewer glial cells. For 100,000 depressed patients each year, electroconvulsive therapy has been the last best hope. Now options are expanding. Psychiatrist Paul Appelbaum on the many causes of violent behavior. Paul Appelbaum on the next big thing in psychiatry.